I don't see it posted yet either but I'm sure it will surface soon. E | The following titles are all slated for released on 32X. L | when they actually arrive is anybody's guess. The rest of the Datazine is also interesting, even by summer 1994 the problems with the Saturn's hardware design were obvious. I have the feeling that this must be some kind of test demo and not a fully developed conversion. Too bad. I was hoping that this prototype (which has been around for some years) would offer much more than what it looks, but we'll know for sure as soon as the ROM is available. ROM is available on Hidden Palace now. I see I wasn't the only one who guessed that pic shows what to expect, and sure enough, that's all there is. You can move around and attack your (lifeless) opponent. Win, your character does an animation, fades to black, back to the same screen. Pausing changes palettes. And that's about it. I wasn't aware this has been a known proto in someone's hands for several years. It may be simple, but it's archiving history in any case, so I'm glad it's out there now. Yeah, it's a real shame. Because of being an April 28, 1995 prototype which has been around in collector's hands for some years, I thought this build of the game would be more fleshed out for a number of reasons. One of them is the fact, like it was already mentioned in this thread, that the arrival of ClayFighter 2 Judgmen Clay for the 32X was already planned back in August 1994, even before the release of the SNES version which hit shelves in early 1995, but I guess that instead of developing the game for both platforms in parallel, they developed for the SNES first and then for the 32X after the SNES version was completed and released. 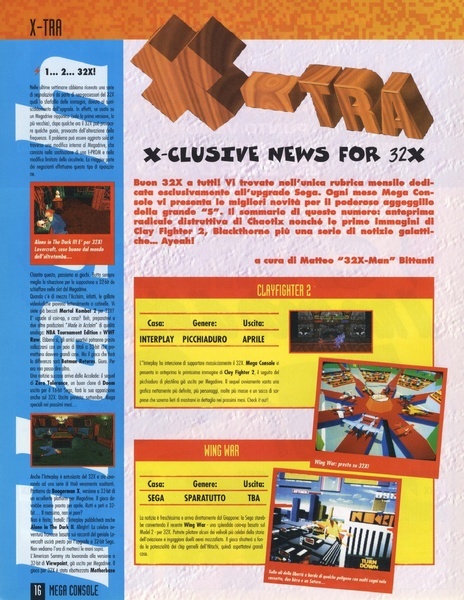 There's also the fact that a couple of Sega Magazines dated from the first months of 1995 (January-March) unveiled what was alleged back then as "the first screenshot of their 32X conversion of ClayFighter 2". And by the looks of it, it appears to be much more developed that the late April ROM we finally have in our hands. So what's wrong here? It's obvious these mags received the same screencap from Interplay, but was that really a 32X version pic or simply a refurbished SNES pic? And if it was an actual 32X version pic, how come it looks more fleshed out than this prototype which is dated later and is just a very early and small test demo? And with only two characters, different to those of the pic. There's something fishy here. Even that's a SNES pic which was delivered as a 32X pic or maybe this conversion had a troubled development and had to be restarted at some middle point, which would explain why an April 28, 1995 prototype is so early instead of being so simple and empty. I guess the answer would only be known by whoever developed this, either Visual Concepts themselves or some porting studio like what happened with ClayFighter for the Mega Drive (which was handled by Ringler Studios). It's also a shame that this game suffered the cancellation when maybe it could have been saved by Sega, like it happened with other two Interplay games for the 32X, Blackthorne and Star Trek: Starfleet Academy Starship Bridge Simulator. These games were also going to fall victim to the fact of Interplay withdrawing from the 32X market, but thanks to Sega signing both of them, they could be finished and released in late 1995, which sadly wasn't the case with ClayFighter 2: Judgment Clay. Interesting point you bring up. My guess is it's likely the 32X one never really got off the ground. Could be like that Lufia port for Genesis where it got advertised and previewed but the actual work that had been done was next to nothing. Apparently they weren't too happy with the second game anyway, so they probably didn't want to waste further time porting unsatisfactory work to another system. The cancelled PSX game and the N64 one which got a second edition due to having to cut some characters in the first release shows they always has issues keeping projects on track I think. Interesting point you bring up. My guess is it's likely the 32X one never really got off the ground. Could be like that Lufia port for Genesis where it got advertised and previewed but the actual work that had been done was next to nothing. I'd suspect the same thing too. 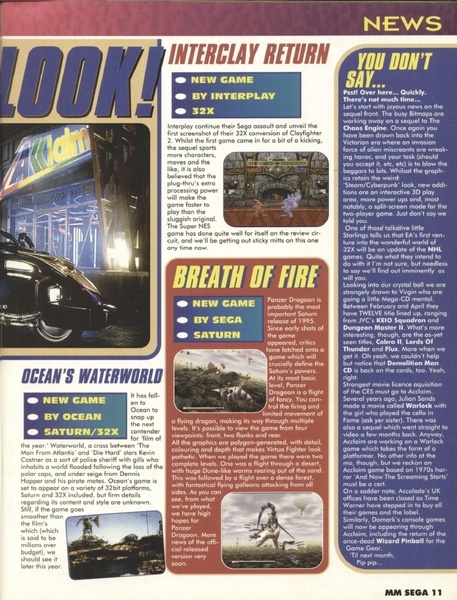 There were quite a few alleged pre-release screenshots in magazines back in the day that turned out to be from versions other than the one being reported on. For example, there were a lot of what were claimed were early Saturn shots of Virtua Racing, Virtua Fighter, and Daytona. They were actually shots of the arcade versions with the game timer disabled in some cases. This was supposed to be a 32X game but the prototype is not even using the add-on hardware. It's all running in Mega Drive mode, sprites included. I suspect the final game would have used a hybrid Mega Drive + 32X hybrid display like the 32X version of Mortal Kombat II does for example. 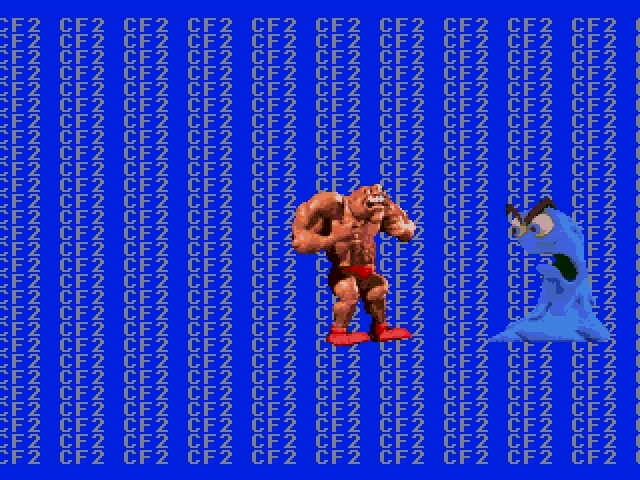 But strictly concerning what we have, this could perfectly be the prototype of a cancelled Mega Drive version of ClayFighter 2 rather than the targeted 32X version. Very strange. To be honest, I think I'd hesitate in even calling this a prototype; it could easily be a proof of concept graphics conversion and animation test, rather than an early form of something that would have become a full game. What's also puzzling to me is that if this was the beginnings of what would have become a 32x game, the developers were taking an unusual approach. Other games on the 32x, e.g. MK2, Primal Rage, Wrestlemania Arcade, and AFAIK NBA Jam TE, tended to use the 32x for sprites and the Mega Drive for backgrounds, while this is using the MD for sprites. Using the MD for backgrounds made 60fps scrolling easier to achieve. Also, if this was intended for the 32x, why didn't they get some 32x code running first? That would have been the obvious thing to do, wouldn't it? It's cool from a historical perspective but kind of a disappointment in regards to the actual game. Too bad this wasn't released on the 32x instead of Brutal.